Round, Oval and Octagon Windows. Finger Joint Sash 1-3/32" thick. Pressed glazed with 1/8" non-tempered glass. Custom sizes are available. 6 and 8-Light: Pine Stain Grade 1-3/8" Thick; putty glazed. Pine Stain Grade 1-3/8" Thick; putty glazed with single strength non-tempered glass. Custom sizes are available. 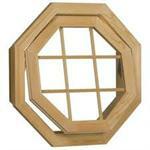 Decorative Octagonal Windows in Venting and Fixed applications. Prime Wood or Clad Exterior. 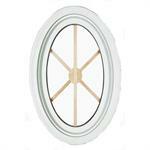 Decorative Oval Windows with Prime Wood or Urethane exterior and pine interior. Round Fixed Windows. 4-9/16" Jamb. Prices include Grid. Clear Pine, 1-1/8" thick, custom made for your window openings. 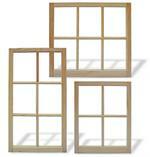 Custom made replacement sash or complete windows for Historic Renovation. Top Sash, Bottom Sash and Fixed Sash. Solid Clear Pine. Putty Glazed with SSB glass or open. Plowed for weights and cords.